Spend a few moments reviewing the transcripts from Nebraska football players over the last couple of weeks and you'll quickly notice a theme: upperclassmen praising underclassmen. It started in Chicago at Big Ten Media Days. When asked who was standing out to Stanley Morgan Jr., the senior wide receiver didn't hesitate. The answer was freshman cornerback Cam Taylor. And then there's freshman running back Maurice Washington. He's about as new to the program as one can get, but his Nebraska teammates are impressed regardless. That's not all the praise, though. The list could truly go on and on. This is not to say upperclassmen haven't been impressed with underclassmen in the past. They have. In Nebraska's current situation though, coach Scott Frost and his staff completely overhauled the Huskers' roster in a little over eight months. That's included more than just recruiting high school athletes and junior college transfers. It also included transfers from other four-year schools and preferred walk-ons (with many making the 110-man fall camp roster). In fact, about a third of Nebraska's roster was new to the program by the time fall camp rolled around. It's enough to keep returners on their toes, especially when every job is up for grabs. Just ask junior cornerback Lamar Jackson. "They've really bought depth for sure," Jackson said. "They've brought some more guys that are talented and are actually pushing people, so it's good to have people on my back and just push me, so I know, 'OK, he's a baller too.' It keeps me on my stuff and makes sure I make limited mistakes. "And at the same time it just keeps us going. That's why the [defensive backs] have all this energy the first four days." 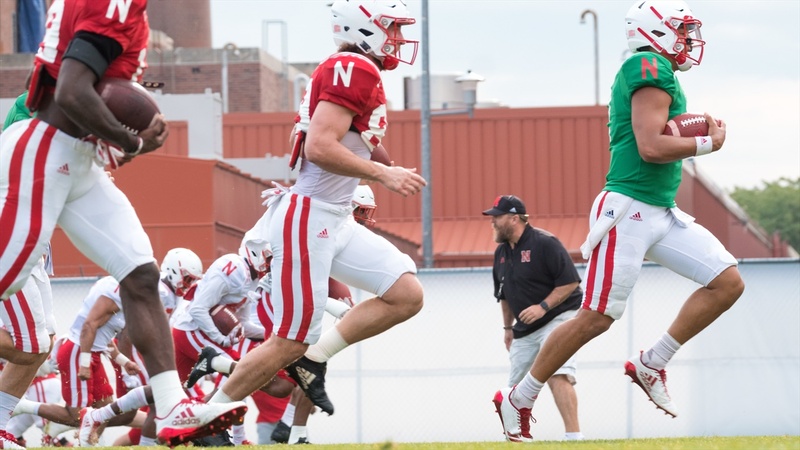 On Wednesday, the Huskers suited up in full pads for the first time of fall camp. It was another opportunity to see the returners in action against those vying for their spots this fall. However, it's not all about competition. Fall camp has encouraged more between players so far. “It’s been awesome,” offensive coordinator Troy Walters said. “Competition-wise, we’re deeper than we were in the spring across the board. That shows up in practice, receivers versus [defensive backs] were getting after it. They’re making us better, we’re making them better. The older guys have embraced the younger guys. We’re a family, and we understand that we need everybody in order to be successful, so the older guys are taking the younger guys under their wing. If the coaches are already expecting to lean on the young players this fall, the upperclassmen should also be expecting it. From what Walters and the other coaches are saying, that's exactly what they've seen on the practice field so far. As for the transcripts? It sounds like they're on board with supporting one another, too.